Coffee handmade soap is made with triple strength fresh coffee, coffee absolute and real Vanilla extract for an extra caffeine kick in the morning. This handmade, artisan soap is made with triple strength blend of fresh coffee, coffee absolute and real vanilla. Each handcrafted bar has a rich aroma of freshly roasted coffee beans with a hint of vanilla. Now you can take your coffee into your bath or shower with you. Enjoy this soap in the morning to help you wake up. The little coffee beans on top are real soap too, made with glycerin soap. The color in this soap is natural. No extra color has been added. Each batch is carefully blended with olive oil, coconut and castor and cured for at least 6 weeks. Mango butter adds extra goodness. My chef and painter friend tells me that it helps remove odor of garlic and onions from his hands. Please keep any handmade soaps out of standing water puddles and use a draining soap dish, so the soap will last longer. Handcrafted soaps contain glycerin, which is a byproduct of soapmaking. Buy one coffee soap for an extra caffeine kick in the morning and keep one bar by your kitchen sink. Ingr: Fresh brewed coffee, Olive oil, Coconut, Palm Kernel, Mango Butter, Castor oil, Soybean, Sodium Hydroxide, Beeswax, Sodium Lactate, Coffee Absolute, Real Vanilla. 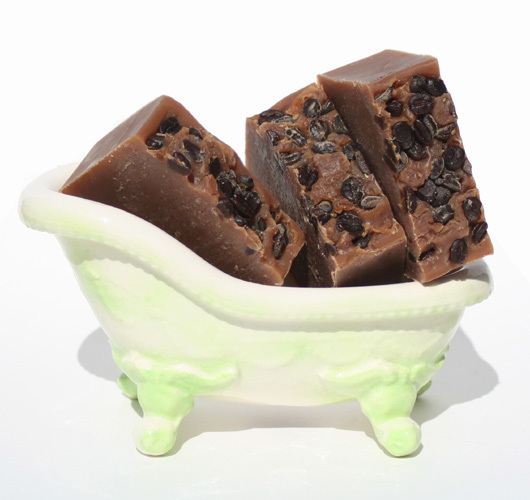 Each handmade soap is topped with glycerin soap coffee beans.